It’s with great pleasure that we announce Wingtip Brewery’s The Captain craft pilsner and Tailgate’s Watermelon Wheat are now available in cans. The popularity of canned craft beer has taken off over the past few years and is now being recognised as the preferred vessel for craft beer. The consumer impression of canned beer has moved away from drinking mass-produced lagers in public places and is shifting toward the current realisation of the environmental benefits of cans and the fact that it is now cool to be seen drinking from craft beer cans. The crisp light taste of The Captain can now be enjoyed fresh from a can, with less oxygen and light exposure in the canning process, and the cans providing an airtight, UV protecting container, the beer remains fresher for longer. 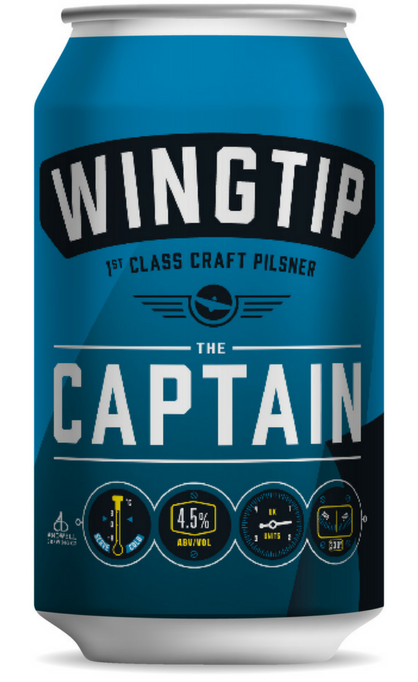 Characterised by a floral hop aroma, with distinctive grassy notes, The Captain pilsner is beautifully balanced with a clean, crisp finish and pleasant lingering bitterness. A highly refreshing, yet lightly carbonated pilsner lager that is a smooth drinking experience from bottle or can! With the recent arrival of Tailgate’s Watermelon Wheat from the brewery in Tennessee, a further benefit of cans has been highlighted - how conveniently transportable they are! As a lighter product and easily stacked, we are able to get more beer into the shipping container making it easier and more environmentally friendly to transport. At 4.9% ABV and with 20 IBUs, Watermelon Wheat is a crisp and gloriously refreshing American pale wheat ale with big fruit flavours bursting onto the palate and finishing with a spicy, dry aftertaste that is perfect for an autumn evening. This year’s Indie Beer Can festival featured a range of ales, lagers, stouts and wheat beers proving that these beer styles, along with already popular IPAs work well served in cans. Aside from keeping the beer fresh and ease of mass transportation, what other benefits are there to drinking craft beer from cans? Keep it cool. Keep it practical. The lighter packaging allows the beer to be cooled quicker and the uniformed shape enables cans to be stacked on the shelf resulting in more beers in the fridge. They are also great for takeaways. Beer cans are also far less likely to break compared to a bottle when dropped by that butter fingered member of staff! Drink it, crush it, recycle it. It’s that simple. The average American beer can contains 40% recycled aluminium and more recently beer cans tend to contain up to 100% recycled aluminium. The recycling of aluminium saves over 90% of the energy required to create new aluminium according to The Aluminium Association. Aluminium is also forever recyclable so there is no reason to ever send a beer can to land fill. With hundreds of craft beer breweries popping up across the country it’s not just the products that draw attention, eye-catching labels and well-crafted designs play a huge part in consumer purchases. With the inclusion of a category for Best Design at the Indie Beer Can festival, there is now a platform for designers to benefit from the craft beer boom and make their name in this field, creating further job opportunities within the industry. Wingtip’s The Captain and Tailgate’s Watermelon Wheat join Tailgate’s Sorta IPA, Grapefruit IPA and Peanut Butter Milk Stout as canned products in our portfolio. Drop us a line for stocking opportunities and keep tabs on our Twitter page for links to your local stockists.